Slow cookers hold a special place in my heart. The convenience factor that they bring to stressful everyday tasks we summarize as “adulting” just can’t be beat really. Not many things compare to that comforting feeling of walking into the house after a long stressful day, only to kick the shoes off your poor little feet and suddenly be greeted by the most comforting smell. I could literally go on a 3 paragraph spiel on why I think slow cookers are totally amazing and absolutely necessary in every kitchen buuuuuut I’ll just keep it short, sweet and to the point. THEY ARE SO DANG EASY. Like so serious guys, we’re talking actual fool-proof easy to use. My family has literally been on a soup craze lately, ever since the weather finally decided to actually feel like winter here in Texas. Oh and speaking of winter… last Friday we got snow!!! I mean..in all reality it probably wasn’t more than 1/10 inch but it’s Texas so it really felt more like we had gone to sleep and woken up in the North Pole (let us dream ok). Another great thing about soup is that it’s a great way to jam pack a bunch of nutritional veggies into one meal and honestly, there’s no better time for that than now. Still recovering from holiday break. Still trying to drop these peppermint chocolate binge session pounds. Souping it up until then. brb. In a skillet, add the ground turkey and season with salt. Cook until no longer brown and add to slow cooker. Add sweetcorn, black beans, rotel, cumin, chili powder, garlic powder, lime juice, red onion and chicken broth. Stir and cover. Cook on low for 5-6 hours or high for 3-4 hours. 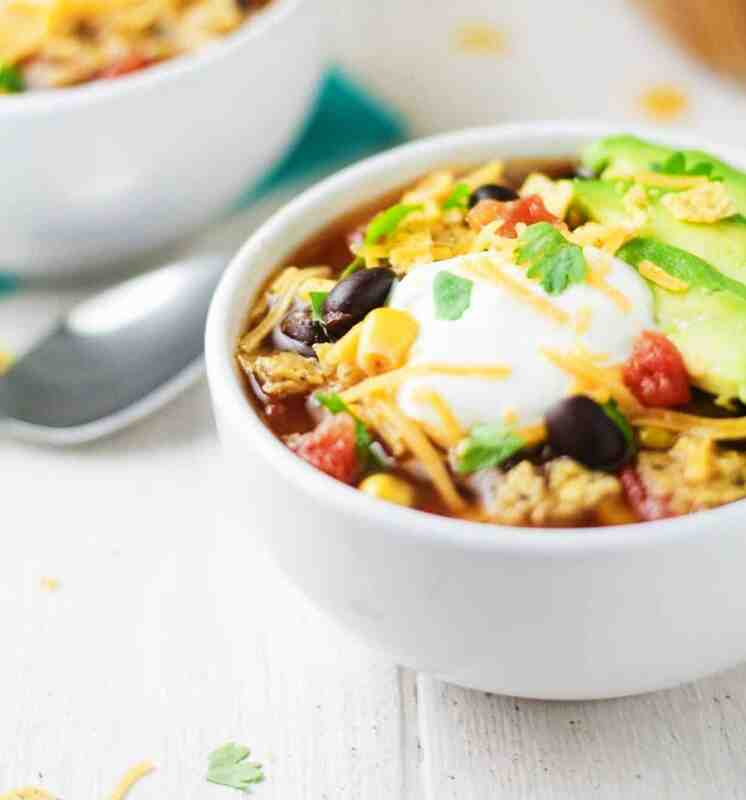 Serve in bowls, crushing up the corn tortillas and adding them to the soup. Top with nonfat Greek yogurt, cheese, sliced avocado and cilantro. Crush up the corn tortillas and Enjoy!